I had a productive day though - feeling the urge to make something in warm colours and here it is : the flowers basket for a flower girl, and guess what, I made the basket myself from something called paper ribbon - at least the little man at the Chester market called it so. We took the kids to Chester two week ago and ended up at the mall, I saw that little man who looked quite bored and seemed not to sell anything from his stall, so I thought I really want to buy something from him, and at that time I even did not know what I am going to do with those milky white, hard and bulky rope...And today I just looked at it again and suddenly it became clear what I wanted to do with it. I guess we all just need to wait until the right moment to see what we really want ???! 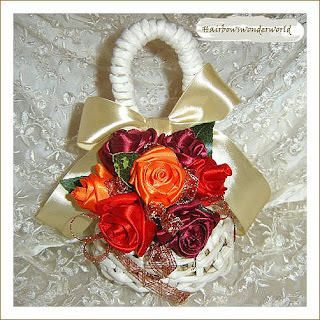 I think this basket will be okay for home decorating as well, I tried to put it on my dressing table and hang it on the door knob and it looks pretty nice. 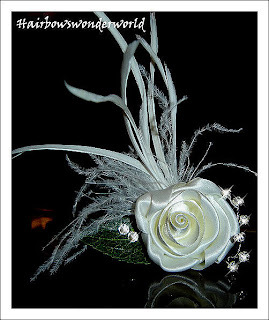 As the kids were so good today, I have finally made this bridal rose hair clip to match my white bouquet. I was really in love with oistrich feathers and I tried my luck with some biot feathers as well. And I didn't forget some sparkling swarowsky crystal and some diamant sprays. It was fun!! !